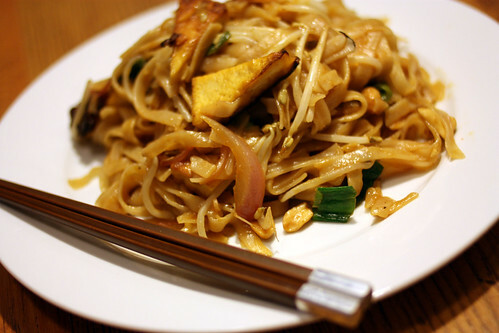 Vegan Pad Thai | Mmm, Tasty! Tonight while finishing up for the day at work I was pondering what to have for dinner. At first I thought I’d just throw together a simple stirfry, since I already had some ingredients for one in our refrigerator. But then I got a sudden craving for pad thai, so printed off my favourite vegan recipe, grabbed the ingredients, and away I went! I can’t take credit for this recipe – that goes to Isa Chandra Moskowitz and her book, Vegan with a Vengeance. Which I’ve posted recipes from before, so you know this book gets a lot of use in our house. I’ve modified the recipe ever-so-slightly to my own tastes. And, let’s be honest here – this isn’t an authentic pad thai. But it is vegan and it is delicious! Pressing tofu: take your block of tofu and remove it from any packaging it is in. Place it on a plate, wrapped in some clean paper towel or a clean dish cloth you don’t mind getting dirty. On top of that, place a heavy object, like a big hardcover book or heavy cast iron frying pan. Leave to press for 30 minutes, then flip it over and repeat the process. Pressing the tofu gets out a lot of the liquid and makes it a more chewy texture. Cutting tofu: once pressed, cut the tofu into small triangles. First, cut the tofu along the short side into 1/2 inch pieces. Then, cut the tofu in the middle along its long side (or length). You now have a bunch of small rectangles. Cut each one in half to create triangles. Set aside while you get the noodles going. Prepare the rice noodles according to the directions on the packet. Once they are almost cooked, you can start on the rest of the recipe – just make sure to time them so you don’t overcook them. Mix together the ingredients for the sauce, stirring well to make sure it’s combined. Set aside. Preheat a large nonstick frying pan or wok over moderate high heat. Pour 2 tablespoons of peanut oil into the pan, giving it a few minutes to heat up. Add in the tofu and stir fry for 4-5 minutes until the tofu is crisp on the outside. Remove from pan and set aside. Pour 2 tablespoons more of peanut oil into the pan. Add half the red onion and cook for 30 seconds. Add half the garlic and half the lemongrass and cook for another 30 seconds. Add half the sauce and when it starts to bubble add half the noodles. Cook for two minutes stirring constantly, then add half each of the tofu, bean sprouts, spring onions, chillies (if using), and peanuts. Stir for 30 more seconds. Transfer to two serving plates and garnish with coriander and lime wedges. Repeat with remaining ingredients for the other two servings.